George was born in Gulfport, Mississippi to the late Benjamin Franklin and Grace Henriquez Grant. He grew up in New Orleans, Louisiana and Tampa Florida. He graduated from Plant High School and the University of Tampa in 1955. He married Lucille Marie Hickey Grant on May 4, 1951 at Sacred Heart Church in Tampa. He was in the U.S. Army stationed in Germany from 1951 -1953. George founded George Grant Company in 1966, a manufacturer's Representative agency selling instrumentation and process equipment with offices throughout the southeast. The company celebrates its 46th year. He is a charter member with his wife Lucille of St. Jude Catholic Church in Chattanooga since 1959. Throughout his life he was an eternal optimist. 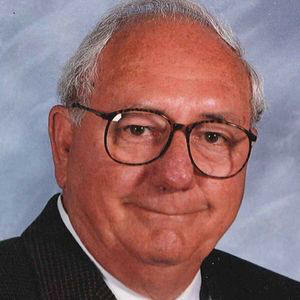 As his children grew up, he was a baseball coach, a Den "Mother" Boy Scout leader, a golf teacher, and a teacher of life. He was a natural salesman and never met a person he didn't like. He had an insatiable curiousity about life. He loved and cherished his family and would do anything for them. George traveled extensively his whole life throughout the United States and Europe. After their children grew up, he and Lucille founded and was Convenor of the Scottish Clan Grant Society of America in 1979. He loved traveling to Scotland and Ireland. He was an avid golfer all his life and was a member of Valleybrook Golf & Country Club for over 40 years. George was preceded in death by his wife of 56 years, Lucille Grant in 2007. A special thanks to his close friend Joy Woodard. He is survived by his sister, Carol Hebert of Louisiana; four children, George (Criss) Grant, Chattanooga; Susan (Richard) Bisbee, Tallahassee, FL; William (Melissa) Grant of Alexandria, VA; Theresa Lynne Harper, Kissimmee, FL; He has eight grandchildren, Richard Grant Bisbee, Blaire Bisbee, Allison Harper, Christopher Harper, Eleanor Grant, Larson Grant, Jennifer Walters and Derek Chastain. Mr. Grant will be taken to Brewer & Sons Funeral Home in Tampa Florida for graveside services to be held at 10:00 AM Saturday at St. Louis Cemetery with Father Corrigan officiating. In lieu of flowers, memorial contributions may be made to Hospice of Chattanooga, 165 Hamm Road, Chattanooga, Tennessee 37405. Arrangements were made by Hamilton Funeral Home & Cremation Services, 4506 Hixson Pike. (423) 531-3975 and Brewer & Sons Funeral Homes in Tampa. Graveside services were held Saturday, May 12, 2012, 10AM at St. Louis Cemetery. Rest in piece George, reunited with your beloved Lucille. You are remembered by your kith and kin. Cuimhnich air na daoine on t�inig thu. / Remember those from whom you are descended.